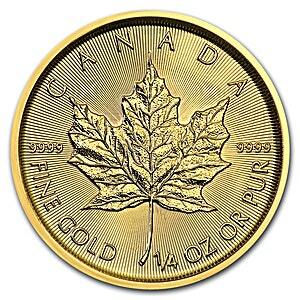 The 1/4 oz Canadian Gold Maple Leaf is fabricated by the Royal Canadian Mint (RCM), Canada’s national mint, located in Canada's capital Ottawa. Each 1/4 oz Gold Maple Leaf contains .9999 pure gold, the highest gold content of any production investment gold coin in the bullion world. The front face of the 1/4 oz gold Maple Leaf coin features a modern portrait of Queen Elizabeth II, Canada’s head of state, with the coin’s face value $20, and the year of manufacture, 2018, inscribed in an arc below. The reverse of the coin displays a handsome design of a Maple Leaf surrounded by the words ‘CANADA’ and ‘FINE GOLD’ ‘1/4 OZ OR PUR’, and the gold coin’s purity 9999. The Royal Canadian Mint is a federal Crown corporation of the Government of Canada and is fully-owned by the Canadian Government. This means that the RCM guarantee is a government guarantee of the purity and authenticity of every gold Maple Leaf coin that the Mint produces. The RCM’s facility in Ottawa is both a mint and a gold and silver refinery, and it also hosts a precious metals storage facility.